Finally a word study test- a ripple of panic around the class. This comes right on the day when Mary McBride’s post raises interesting questions as to the purpose and nature of what we are doing in the name of assessment and data collection. For me it raises questions about our relentless quest for data – the dark cloud shrouding all of us these days in education. What is the balance between informal, observational assessment and formal written assessment? Once assessed what do we do with this information? So today is the first formal word study assessment since school began. I worry about the assessment piece: what is it that is important and worth knowing ? What skills are relevant and why? How does this assessment help develop critical thinking? Here’s what I asked in the word study assement. Match the words with their roots.Write the ROOT and the language of origin. See below. stranger, refugee ,outcast ,pariah, outsider, immigrant, foreigner, misfit, asylum-seeker, alien, arrival, exile. Which word is connected to doors/ doorways? Explain. Which is the only word that comes from Greek roots? Which word has a connection to a drum? Explain. Which word (or words) are compound words? Explain the term compound in your answer . Which words have a free base element? Prove this by dividing the word/s into morphemes. List all the suffixes you see in the words above. 1. Explain the difference in denotation and connotation between a refugee and an immigrant. (To answer this, you need to define both words and then explain how they are different).Refer to roots. 2. Out of all the words above… which is most positive? Which the most negative?Consider this in terms of who has the most (or least) power. You must refer to denotations and roots in your choices. You may choose to support your claims with examples from The Island by Armin Greder, the poem What Do You Do with a Variation? by James Berry, Donne’s No Man is an Island or Von Gederen’s short film Mankind is No Island (or any other relevant texts). I want the students to apply their etymological and morphological knowledge and show me what they understand about these processes. I can then assess individuals and decide what concepts need consolidation, which students need some individual work with me. What does the class collectively know? What concepts are shaky? What have I blithely assumed? What do I need to do to modify in my instruction? What do I need revisit and make more explicit? We have discussed that the roots will be written and visible on the test but not their meaning nor language of origin. I want students to take responsibility for knowing what the roots mean. This helps students see how words can change over time as well as understand nuances between synoyms and of course see the shared meaning found in all related words (words sharing the same base). I hope that the previous weeks’ discussion has consolidated understandings about the words . The second part of the test requires application of etymological, perhaps morphological knowledge and justification of a position – the most negative and the most positive. I expect students to draw on their current texts to support their claims- no right or wrong … more a well wrought argument…thus tying into the student’s ability to justify and craft arguments but based an appreciation of the subtle nuances between words. The test took an eighty minute class period yesterday. After a quick glance through their work I see that some students remain confused about aspects of morphology. They do not always analyze fully into the morphemes suggesting perhaps that some suffixes need more consolidation. Some students have not learned the meaning of the root guessing wildly at the language of origin. I hope these students take from this the necessity to prepare for assessments – not through rote learning but by asking questions in class of their peers and of me. To remain confused and passively accept this state of confusion is not helpful! This shows I need to provide experiences that allow students to be more aware of the clues that indicate a word is Greek (Real Spelling Tool Box) and of the clues that indicate OE, Latinate and French origins. For example we have several times mentioned that Latin etymons have suffixes (?) ere, are, ire indicating the verbal infinitive form. Some students have noted this pattern but perhaps more work and exploration around this. I can review with the class the tendencies of words from Old English to be shorter, more direct, less elevated in register. Maybe more work the graphemes that give clues to the O.E roots, about the differences in register when we use words from Old English, and words from Latin to explore the effect on the reader or listener. I notice with disappointment that several students tend to gloss over instructions…did not provide roots or adequately support their claims in Part 4 with textual references. able to discuss whether the connotation of word is positive or negative. Many in their explanation refer to its denotation and the roots. The earlier discussions have helped with this. Many students did know the meaning of the roots and could state the language of origin. The majority knew that asylum was Greek..many knew that despite the ex in exile that it was a free base element as no other words could be found sharing the same Latin root exilium/exsilare. Many too recognized the difference between synchronic and diachronic analysis as seen with with asylum as the analysis had involved a class discussion as to how far to analyze a word. I know some students and especially me, are guilty of ruthlessly slicing through a word to its merest morpheme. This is leading to interesting class discussions as to just how far to go on the ‘Great Morpheme Hunt’. However, we are beginning to see that it depends on our focus- whether our focus is diachronic ( through time) or synchronic (in current present day English). We saw the a- as a prefix and –um as a Latinate suffix, replacing the previous Greek –om,/-os to see the Greek root syle: right of seizure ‘lierally an inviolable place’. Thus can be analyzed as <a+syl(e)+um>. However, when discussing synchronic etymology and identifying words that share the same base element in present day English then we realize we cannot analyze as extensively. The prefix a- cannot be replaced by another, nor the suffix -um interchanged with another so the base then in PDE is ‘asylum’ and a free base element. Again more experiences here for this to be more solidly grasped. For a far more lucid explanation of diachronic and synchronic analysis read the Lex response in comments to an earlier post Arrogant, Loyal and Malicious in Plain English. Quite a few understood ‘compound word’ but were not specific enough in their explanation. Too many assume two free base elements make a compound word ..not wrong but limited as two bound base elements and possibly a bound and a free base element also are compound words. ( I’d hope earlier memories of analysing malevolent would have kicked in here).Perhaps this could be a challenge later for all to find words that are compound but with two bound bases and a free and bound. This would help deepen their knowledge about compounds. A lot understood, a lot to review… it’s a spiral, the same recurring concepts but different words and hopefully going deeper and understanding more each time. ‘The most positive word I believe is arrival. The root is Latin ripa ’of the shore’. In those days no-one had aeroplanes they travelled by boat. They would have arrived on the shore. This word is positive because it is a lot nicer to call someone a new arrival, than a stranger or foreigner. If someone is an arrival it seems to mean to me that they just came here and they are greeted and respected and accepted into the group. If someone is a foreigner though they are treated differently as if they are abnormal and people tend to push them away from their group. In the Island by Armin Greder they the islanders treated the stranger not as a new arrival to the ir shore but as an outsider. A misfit. A difference and so they didn’t know what to do with him, just like in the poem by Berry,”What do you do with a Variation”. If they had called him a new arrival and told the others that he was an arrival to their shores they would have accepted him and treated him as their friend. An arrival has more power than a foreigner or a stranger. If someone is a stranger you say”I don’t know you, you are different from me so you are below me.” With an arrival you’d say, “Hello! Did you get here?” I treat you then as a new friend. This proves there is a lot of power in the choice of these words. Emma in her response is in agreement with Luciana about arrival but chose outcast as the most negative in connotation. I think the most positive word is ‘arrival.’ ‘Arrival’ means “the action or process of arriving”. It comes from Old English ‘ripa’ meaning “to reach the shore”. Arriving doesn’t have to be a strange or foreboding thing- an arrival is uually exciting! You can arrive at a party or at a beach. Your grandparents can arrive at your house. Even if issued in the context of arriving in a new country, that can be a good thing too! When I moved to Norway, I was so excited. The root, Latin, means “to the shore” and in my opinion that has a sense of anticipation, and strange new lands to be explored. Arriving is definitely the most powerful. Quick glances at these assessments shows these students are no ‘dunces’ and need not wear the hat of humiliation and shame! 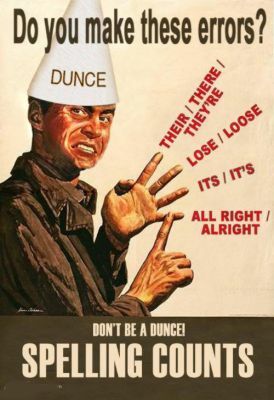 Dunce is a fascinating word, an eponym that has generalized and pejorated- read about it here at Etymology on Line.